← In the blink of an eye . . .
A pot of perfectly cooked black beans served as the base for this delicious soup. Lacking a go-to black bean soup recipe, I turned to the internet and found a recipe for TGI Friday’s Black Bean Soup. I’ve never had the soup at the restaurant (I think I’ve eaten there twice in my life), but this soup is quite tasty! *The original recipe calls for liquid smoke. I had good intentions of purchasing some recently, but balked when I saw the ingredient list, which included unnecessary color additives. I used smoked salt and smoked paprika to give the soup that same smokey flavor. In a large pot, saute the veggies in the oil. Puree half of the black beans (3 cups, or slightly more for a thicker soup) with the liquid (bean juice, broth or water). Combine all ingredients in the pot with the sauteed veggies. Simmer 30-60 minutes (depending on how thick you want it or how impatient you are to eat). We garnished our soup with chopped green onions and frozen corn. Shredded cheese or sour cream would also make good toppings. 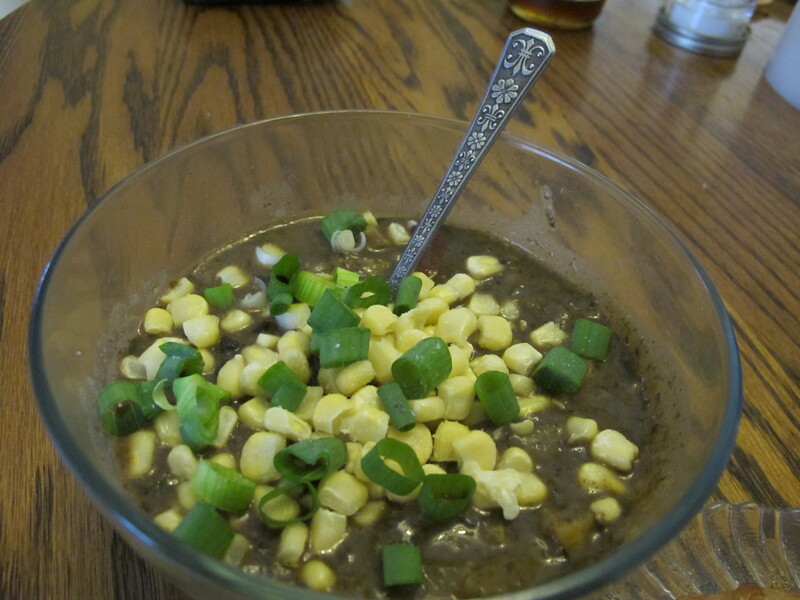 This entry was posted in Food, Recipes and tagged black bean soup, vegan, vegetarian. Bookmark the permalink. if you fry the onions and cumin seed together and then add it to the soup, that is another excellent way to bring out the cumin flavour.